It’s no surprise that we carry a number of flower-themed quilts but flowers are not a common theme in baby quilts. Except in this charming, handmade Vintage Flowers Baby Quilt, purchased from an estate sale directly from the US family. This vintage baby quilt would make a delightful wall hanging in a nursery. The hand embroidered flowers are still nicely bright and easily add a garden flavor to the nursery. When you see the baby quilt up close, details emerge including that every flower has a visitor. 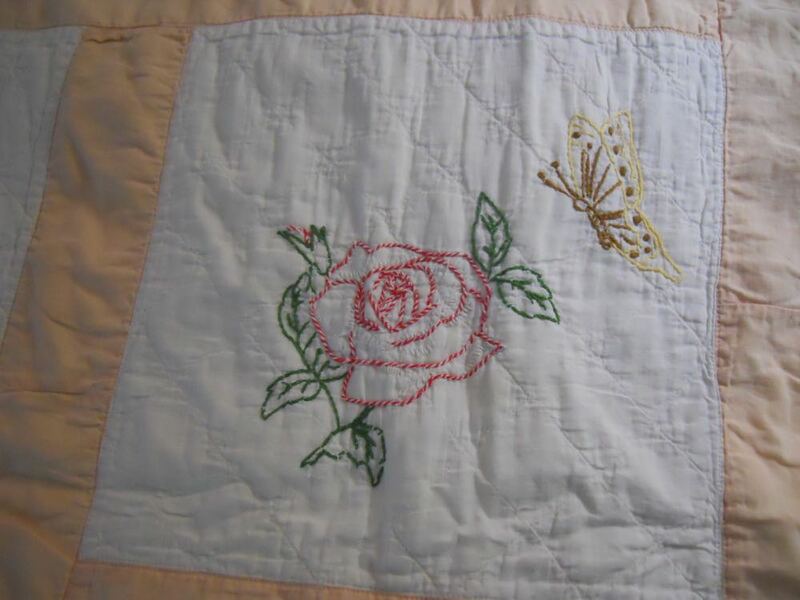 The rose flower block, for example, features an embroidered yellow butterfly. To easily hang this Vintage Flowers baby quilt on a nursery wall, wooden hangars are available so nothing has to be sewn onto the quilt. We can also add fabric tabs on the back to quickly turn this baby quilt into a wall hanging. Just because its vintage doesn’t mean it can’t be used in a baby bed. This baby quilt is in excellent condition and has many years of cuddling still ahead!